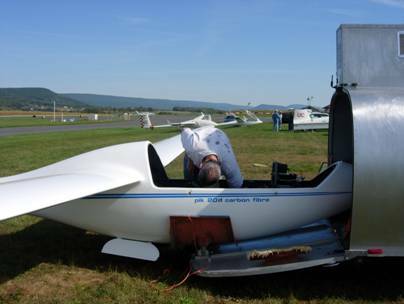 Mifflin County Airport: Running the ridges of Pennsylvania. 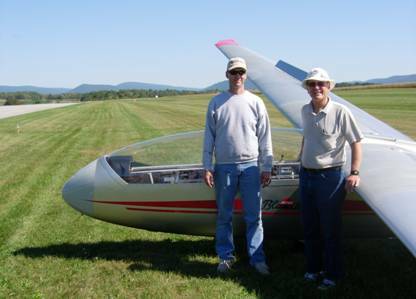 Each year (most years), we take a soaring trip in late September - early October to 'fly the ridges' from Mifflin County Airport in Reedsville, central Pennsylvania. (above) looking northeast along the valley. That's a taxiway in the midground, not the runway. Conditions on this day (9/28) were great for both ridge and thermaling -- if you kept away from the isolated showers. (above): Jack's Mountain, the 'beginner ridge', looking to the southwest. A northwest wind (blowing from the right) makes the ridge work. The airport is just beyond the picture frame to the right. You can run 20 miles along Jack's Mountain to Mill Creek. The ridge peak is about 1400 feet above the valley floor. (above): Looking northeast from about 4000 feet. 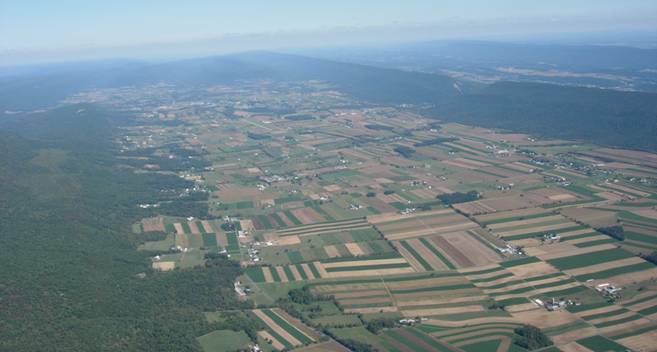 The airport is on the valley centerline, about 1/3 of the way down from the top of the photo. Jack's Mountain is on the right, broken by 'the gap' where highway 322 goes through. On the left is Stone Mountain, which works with a wind from the south or southeast. Many of the farms in the valley are Amish farms -- no electric wires. Seven Mountains (seen also in the picture below) lies to the left out of the picture frame. (above). Looking southeast from Seven Mountains toward the airport (closer to left than right); beyond the airport are Jack's Mountain and 'the gap'. After mastering the beginner ridge, the next big step is to use thermals to get from one ridge to another. 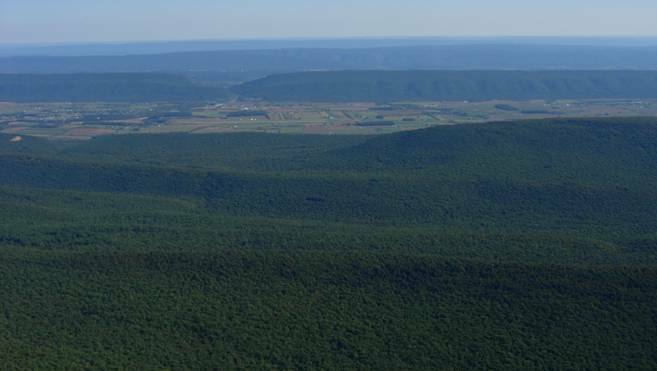 If you find the thermals to get yourself over Seven Mountains to the northwest, you can get on Tussey Ridge (behind the camera in the view above) and run down to Cumberland, about 90 miles to the southwest. Several Nutmeg members have gotten their 300 km distance badge running exactly these ridges, and one (Todd S.) has done a 750 km here. Superblanik rigged and ready to go. 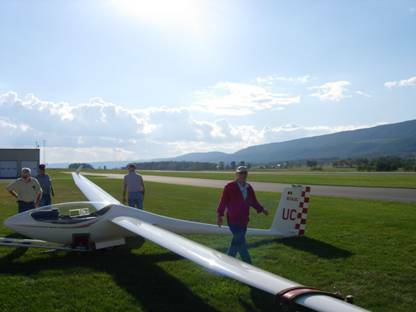 The blacktop runway is 5000 feet long -- or you can land on the grass on its northwest edge. Conditions on Friday, 9/28 were great for both ridge and thermaling. (See also top photo in this section). 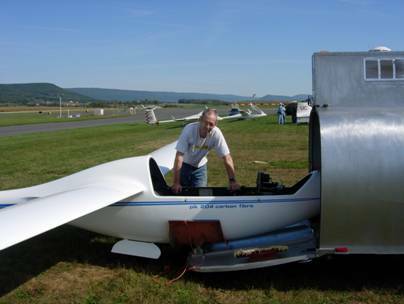 Resident tow pilot Butch T. is at left; also present are area airport/glider friends Gene G. and Brian G. (back to camera, for some reason). (above) Dealing with a vario that lost its mind. Background: several pilots and others helpfully stay out of the way by concentrating on the traditional post-flight peanuts and Koolaid.